“Is that a weed?” That’s my sister, Candi. She lives in one of those golf communities where the maintenance crews mow and primp everyone’s yard as well as all the common areas. I think they allow her a 3 square foot area to “garden”. She’s my big sister which should explain everything. Her house and yard are always spotless and manicured, whereas my yard is 15 acres in the middle of nowhere. Anywhere farther than 10 minutes from the nearest grocery store was nowhere to her. Even her dog smells good, whereas, mine smells like she’s been chasing varmints all day and swimming in the pond, which, alas, she has. In case you missed it, the FNPS Board Meeting and Council of Chapters Meeting was on August 13 at the FFS Leadership Training Center in Haines City. If you want to know more about what the Society is doing on the state level to support chapters and further our mission, or if you want to make a meaningful contribution to the society, please consider attending one of the quarterly retreats. Here are some of the highlights of what we discussed and accomplished. To read the complete summary, along with additional topics, click here. Submitted by Donna Bollenbach FNPS Meets the Wild West…. The venue for the 2017 FNPS conference (May 17-21, 2017) was unveiled and approved by the board, and the winner is Westgate River Ranch Resort & Rodeo. In a secluded location just south of US Hwy 60 on the Kissimmee River, Westgate River Ranch is centrally located between the Atlantic and Gulf beaches within Polk County, Florida. 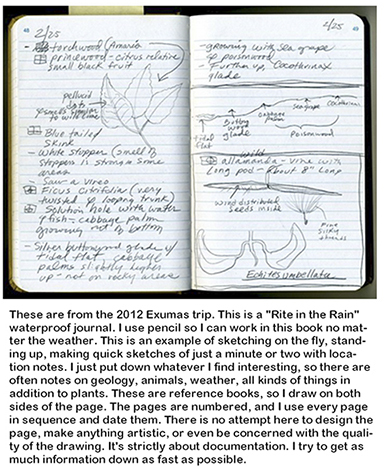 Keeping a Nature Journal: Understanding your environment through observation, writing and drawing. There is no better way to connect with nature than by keeping a nature journal: a collection of observations, interpretations and feelings that describe or illustrate your personal view of the natural world. Nature journals are most commonly in the form of writing, drawing or photographs, or a combination of these. Nature Journaling is rewarding for both children and adults. It is a great a learning tool, as well as a way to develop a deeper understanding and appreciation of nature by recording and sharing memories. What is a Nature Journal? A Nature Journal is a personal record, but it is not a diary. 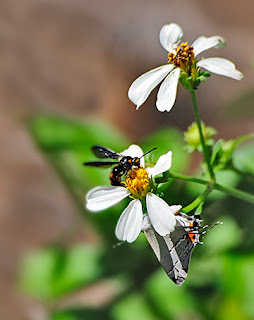 A diary is generally about you and your relationships to other people, while a Nature Journal is about your relationship to the natural world-animals, plants, seasons and climates. The conference was at Dayton Beach Resort right on the Atlantic Ocean. Surf temp was a warm 78 degrees. There were Least Terns on the beach. 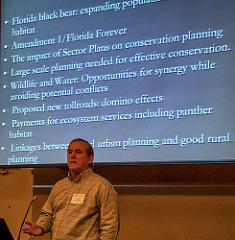 Dr. Tom Hoctor, Director of the University of Florida Center for Landscape Conservation Planning, updated us on the status of the Florida Wildlife Corridors and habitat preservation.